Business leaders have urged the Scottish government to resist increasing tax rates and instead "steady Scotland's economic ship". The Federation of Small Businesses said tax hikes would not be welcome in already turbulent trading conditions. It came as a survey suggested a majority of Scottish small business owners opposed increases in income tax. 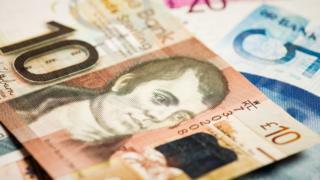 The Scottish government is due to publish its tax and spending plans in its draft budget on Thursday. It is expected to include tax rises, after Nicola Sturgeon said the time was right to consider "modest" increases to fund public services. However, in a poll of 315 business in Scotland in November, the Federation of Small Businesses (FSB) found that almost three fifths (58.3%) wanted income tax rates to stay the same. About one in five (20.7%) backed a decrease, while a similar proportion (21%) supported a rise. About two thirds (65%) said an increase in income tax would be detrimental to the economy, compared to 18% who thought it would be a boost and 17% who suggested it would have no impact. FSB Scottish policy convenor Andy Willox said: "A clear majority of those that run their own business in Scotland don't want the finance secretary to increase income tax rates. "Those asked warned of the impact on the wider economy, and little wonder with pressure on household incomes and uncertainties about the impact of Brexit." The first minister has set out four options, indicating that those earning more than £31,000 could be in line to pay more. The government's four alternative approaches include having anything up to six tax bands, while three out of the four feature a 50p additional rate and incremental changes to the basic and higher rates. The FSB survey found that just under half of business owners preferred the proposal with the largest number of bands and rates. Of those surveyed, 64.8% were basic rate taxpayers earning between £11,501 and £43,000, around a fifth (22.5%) earned between £43,001 to £150,000 and 1.6% fell into the additional rate bracket, earning more than £150,000 per year. Mr Willox added: "This data scotches the myth that business owners are all high earners. Further, when forced to choose between ministers' palette of tax options, the largest share of business owners chose what could be regarded as the more progressive option. "They seem to be less worried about their own wallets and more concerned about the wider economy. "That's why, overall, smaller businesses don't want to see tax change. "As FSB warned ahead of the UK budget, trading conditions are already turbulent, and additional tax hikes - for them or their customers - are not what we need right now. The Scottish government must resist the siren song of a big change budget, and do what they can to steady Scotland's economic ship." Finance Secretary Mackay has sought to reassure businesses by saying economic growth and innovation will be at the heart of the budget. A government spokeswoman said: "Our income tax discussion paper outlined four key tests that we feel any change in income tax must meet. One of those was that, when combined with our spending decisions, any change in tax policy should support the economy. "Following this careful and considered discussion, we will publish a balanced package of tax and spending proposals as part of the draft budget on 14 December."